It's Saturday. Do anything except think about the markets or economics. The markets stood still today. When the market doesn't move it simply means the bulls and bears are evenly matched. In addition, after the strong week for the market with little negative news to speak of, traders were probably phoning this day in. The two day chart shows the inaction. Basically, we closed where we started. The 5-day chart shows the market broke the two day downtrend, but that was about it. It traded along Tuesday's closing price. The daily chart shows the same thing. Notice how far above the 10 day SMA the close is. Prices don't usually move above a moving average for a lengthy amount of time; moving averages are a lot like a center of gravity for prices. Expect the market to continue to move towards the moving average next week. Here is the oil market represented by the USO ETF. Notice the pattern of higher highs and higher lows along an uptrend. This is what a strong market looks like. Oil traders are betting low rates will increase oil and gas demand. The 5-day chart of gold shows a technical sell-off, as traders sold the gold ETF to the 38.2% Fibonacci level. This looks like simple profit taking to me. The medium term Treasury market rose today. Traders are now betting on slower growth. However, note the market rallied to a 50% Fibonacci fan. This could mean the rally is short-lived as traders start to sell again next week. 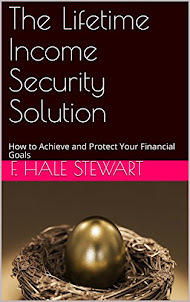 In other words, the current cost of money is far from restrictive. That means the problems in the economy are probably not driven by money being too expensive, but one of confidence. Lenders are still concerned about borrowers ability to pay back a loan even over a short time period. Lower rates won't solve that problem: there is still a ton a bad debt in the system. Did Ben Think About This? One of the primary reasons I was (and am) against the rate cut is the impact on the US dollar. The markets are currently playing out that scenario. The Fed's move put more pressure on the dollar because it made returns on investment in other countries more valuable. The weak dollar also means that American goods are cheaper for overseas buyers, which can help manufacturing and producers, and can help companies with big foreign operations turn a larger profit by converting overseas profit into dollars. 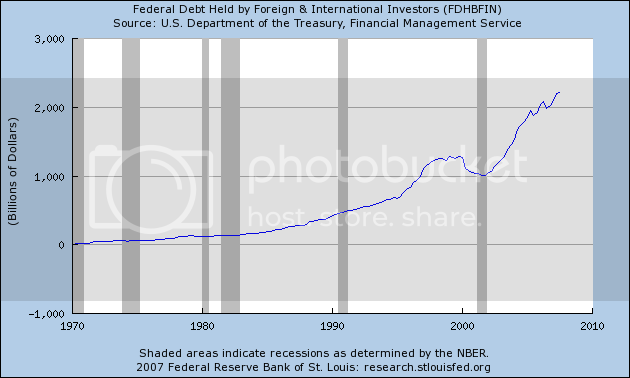 But it also could scare away foreign investors who help to finance the U.S.'s debt. As investment in U.S. Treasury securities dwindles, the government will have to pay higher rates at weekly auctions to find buyers for its bills, notes and bonds. That eventually could push up borrowing costs for all Americans. My guess is this will add further long-term upward pressure on interest rates. The U.S. commercial paper market shrank for a sixth week, extending the biggest slump in at least seven years and signaling Federal Reserve interest rate cuts haven't yet drawn investors back to short-term debt. Short-term debt maturing in 270 days or less fell $48.1 billion in the week ended yesterday to a seasonally adjusted $1.87 trillion, including a $32.1 billion decline in financial commercial paper. Asset-backed debt dropped $15.6 billion, according to the Fed in Washington. Commercial paper outstanding has declined $354.5 billion, or almost 16 percent, since the week ended Aug. 8 as investors retreated to the safety of government debt. The slump that began in asset-backed paper spilled to financial companies, where the decline in issuance accelerated. The prospect of a slowing economy, which prompted the Fed to act this week, may have caused firms to reduce sales, said Tony Crescenzi, chief bond market strategist at Miller Tabak & Co. in New York. It's too early for the rate cuts to have a big impact, but these are very important numbers for the next few weeks. We're starting to see how the rate cut will shake out in the markets. I'm not sure if Ben will be happy with these developments. We see that for the last day and a half, the SPYs have traded in a downward trend. This is not the most pronounced trend we will see, but it is a trend nonetheless. My guess is we've seen all the buying we're going to see from the rate cut rally and now traders are waiting for the next move in one direction or the other. The five day chart shows that we're approaching the 38.2% Fibonacci level from the latest rally. On the daily chart we see the SPYs taking a breather. A sell-off after the last two days was to be expected. I wouldn't be surprised to see a continuation of this pattern tomorrow. Look at how gold jumped over the last two days. Traders are obviously concerned about the inflationary ramifications of the rate cut. The two year daily chart of the gold ETF shows we're now at a record high. Record highs have a way of making further record highs. Also notice the gold ETF has a nice two year base to work upwards from. In other words, there is clearly upward momentum in the gold ETF right now. The long-Treasury ETF shows the bond traders are selling as they too are concerned about inflationary pressures increasing from the rate cut. The markets show a very clear pattern. Traders are worried about inflation increasing. Ben, What Have You Wrought? The dollar fell to the lowest versus the euro since the European currency's inception in 1999 on speculation the Federal Reserve will continue to reduce interest rates, dimming the allure of U.S. assets. Gold rose to a 27-year high as the dollar fell to a record low against the euro and the spread between the two- and 10-year U.S. Treasuries widened, fueling demand for the metal as an inflation hedge. Silver also climbed. Gold's gain today was the biggest in seven months, sending bullion up almost 17 percent for the year and heading for its seventh straight annual gain. The yield spread on Treasuries widened to the most since May 2005 on speculation a plunge in the U.S. currency and the Federal Reserve's first interest-rate cut in four years will spark inflation. The difference between two- and 10- year Treasury note yields increased to the widest since May 2005 on speculation the tumbling dollar and the Federal Reserve's cut in borrowing costs will fuel inflation. Yields on 10-year notes, more sensitive to inflation expectations than shorter-term securities, rose faster than those on two-year notes, steepening the so-called yield curve. A Fed report showed manufacturing in the Philadelphia region accelerated more than economists forecast this month. Mortgage delinquencies jumped again in August, according to new data from Equifax and Moody's Economy.com. The new data provide the first big-picture look at how the credit crunch is hitting homeowners. Nationwide, 3.56% of mortgages were at least 30 days past due last month, up 0.31 percentage points from July. The delinquency rate has increased about 1.5 points since bottoming out at the end of 2005, with fully half of that increase coming in the last three months. Delinquencies have climbed since August 2006 in all 50 states, and 10 states have posted an increase of more than one percentage point. 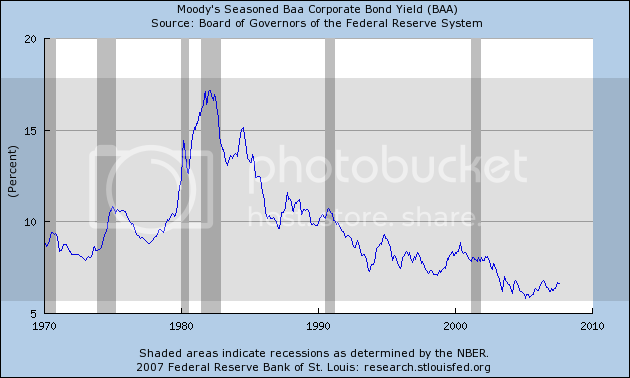 The rise in bad loans is "broad based," says Mark Zandi, chief economist at Moody's Economy.com. "That signals that foreclosure problems are going to be widespread." Notice that late payments are accelerating. 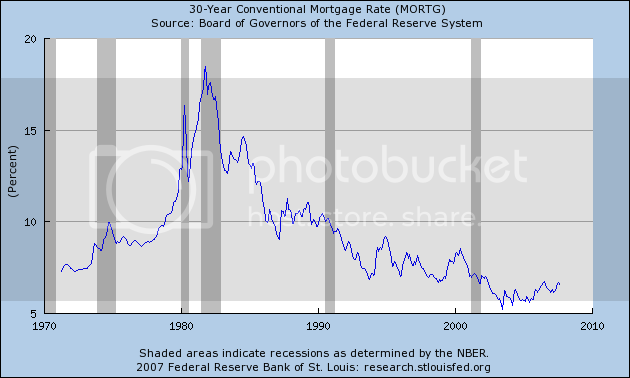 Take a look at this graph that shows when mortgage resets will occur and by how much. A weaker greenback gives oil producers an extra incentive to drive prices higher: Oil is denominated in dollars on the global market, so producers are being paid for their output in less-valuable currency. Late yesterday in New York, one euro bought $1.3962, compared with $1.3201 at the start of the year, a 6% weakening of the dollar. One gauge used by the Federal Reserve shows the dollar at its weakest in a decade as measured against a broad range of currencies. Oil reached an intraday New York Mercantile Exchange record of $82.51 a barrel yesterday before closing at $81.93, up 42 cents, or 0.5%, on the day and 34% higher for the year. That is still well off the high, in inflation-adjusted terms, above $100 in 1980. Since the start of 2003, when one euro bought just $1.05, crude's price has risen 163%. Let's look at a few charts. 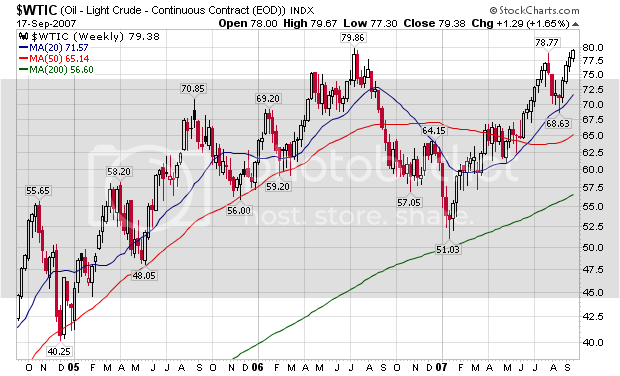 The weekly oil chart shows this market selling off at the end last summer. 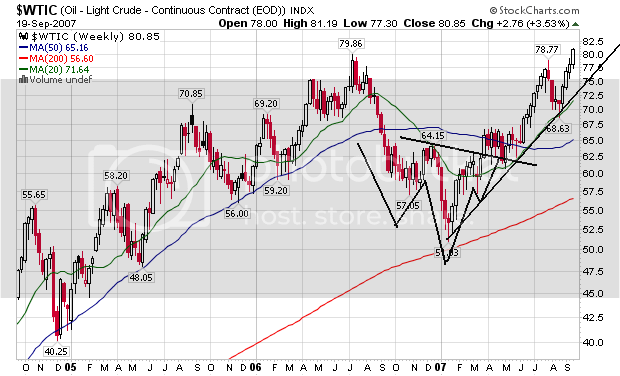 It consolidated in a head and shoulders pattern over the winter and has been rising since. Remember at the end of last summer Goldman Sachs rebalanced their energy benchmark which was a big reason for oil's price drop. In other words -- last summer's drop was extremely technical and not fundamental. On oil's daily chart we have a consolidation area this spring followed by a rally, profit taking sell-off and then another rally. Currently, all three moving averages are moving up and the 20-day SMA just crossed the 50 day SMA. The shorter SMAs are above the longer SMAs. This chart says buy me in a pretty big way. Driving the market now is a decrease in US gasoline stocks. The long-term dollar chart is extremely bearish. All the SMAs are moving lower and the shorter SMAs are below the longer SMAs. This chart says sell me pretty convincingly. Despite registering declines in each of the last three months, the index for energy increased at a 12.7 percent SAAR through August. Petroleum-based energy led the acceleration with a 22.7 percent increase at an annual rate. Last year the overall energy index rose 2.9 percent. Yesterday's CPI report will be an statistical anomaly. I'm expecting energy prices to be a big problem within the next 6-9 months. If I'm right, then consumers will have to choose between filling up and buying Christmas presents. Not only oil is affected. Most commodities are denominated in dollars, and commodity producers are often paid for in dollars, so commodities prices in general have risen as the dollar becomes less valuable. Remember that the 10-year Treasury and mortgage rates are closely tied to one another. Mortgage traders use the 10-year Treasury as a hedging tool in their portfolio. 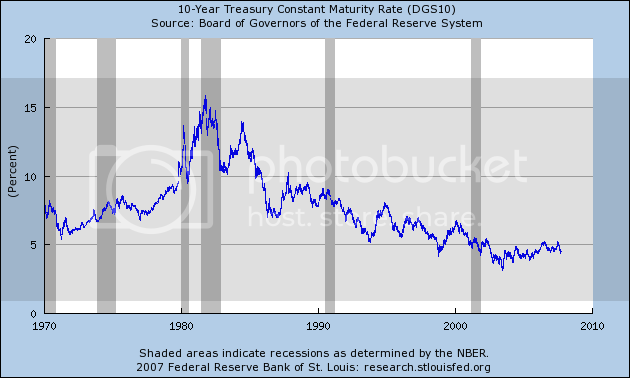 So, the value or yield of the 10-year is very important in the mortgage market. Notice the 10-year yield has been dropping for the better part of the last few months. The reason is simple. The Fed continually said they were more concerned with fighting inflation and bond traders believed them (see this post for a complete rundown of all FOMC statements since January). Yesterday the Fed basically said, "while inflation is still of a concern, we're now more concerned about economic growth." By lowering rates, the Fed was making the economy more vulnerable to inflation. 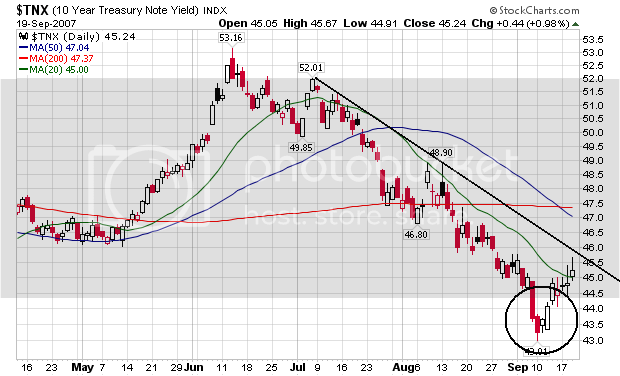 This eats away at fixed income streams, so traders sell the 10-year Treasury. 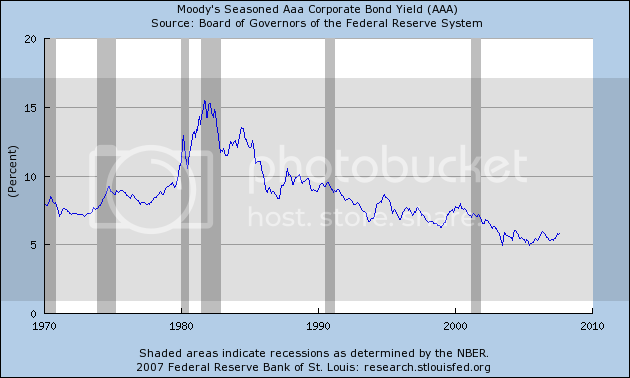 Because a bond's price and yield are inversely related, yields now move up -- which starts to increase mortgage rates. 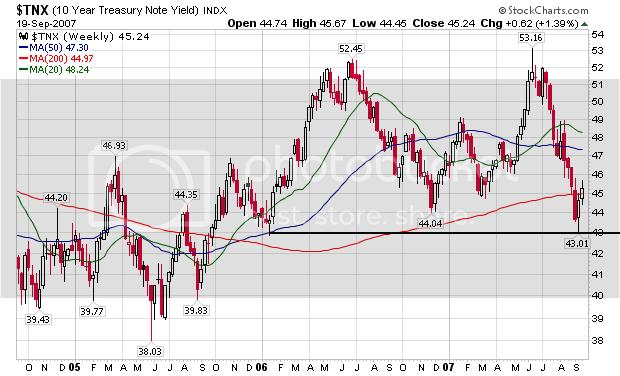 As this weekly chart of the 10 year Treasury shows, yields are at a technically important point. Yields have been coming down (so prices are have been moving up). At this point, traders are simply looking for a reason to sell -- the Fed gave them one. The US economy is now more vulnerable to inflation thanks to yesterday's rate cut. And today's CPI report notwithstanding, there is great cause to be concerned about commodity inflation right now. During the first eight months of 2007, the CPI-U rose at a 3.7 percent seasonally adjusted annual rate (SAAR). This compares with an increase of 2.5 percent for all of 2006. Of course, this is only if you're counting such unnecessary items as food and energy. The gold ETF confirms the increase of the fear of inflation. Traders big up this sector big time after the rate cut. Oil is hitting new highs. And agricultural prices have been increasing for the last two years. The more I look at yesterday's rate cut, the less happy I am about it. The markets were higher today, but only because of an opening pop. After the opening, the market drifted down for the remainder of the day. This shouldn't be surprising. After yesterday's post-Fed rally, it's understandable that traders would back away from the market a bit. Also notice we have two gap ups -- one that occurred right after the rate cut, and another that happened at today's opening. That's a lot of technical real estate. Looking at the 8 day picture, we see the rally that started 8 days ago, followed by the formation of a base while the market waited for the Fed, followed by a big jump after the rate cuts. Notice that after the rate cuts we see a ton of volume but that today's volume was a bit weaker. The daily chart shows the market pulled away from it's trading range but now looks over-extended. We had a big move yesterday on heavy volume, but today's follow-through was not that convincing. Today's bat printed very weakly and the volume was not that impressive. I wouldn't be surprised to see the market drift lower for the rest of the week to catch its breath. LONDON (Thomson Financial) - US crude oil stocks fell by a greater-than-expected 3.8 mln barrels in the week to Sept 14, while gasoline inventories rose by 400,000 barrels against expectations for a decline, the US Energy Information Administration said. The report said, however, that at 318.8 mln barrels, US crude oil inventories remain at the upper end of the average range for this time of year. Gas prices are supposed to drop in the fall as the summer driving season ends. 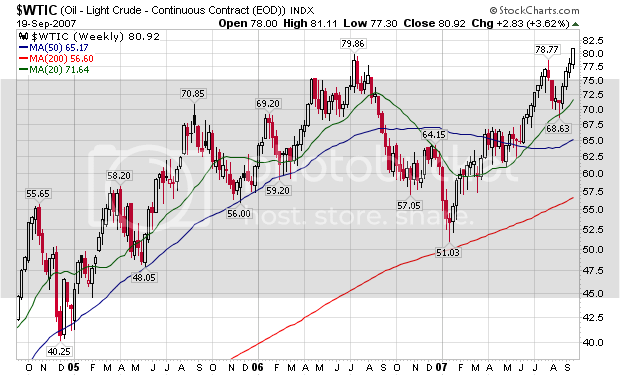 However, with tight supplies the possibility of gas prices remaining at current levels or moving higher is increasing. 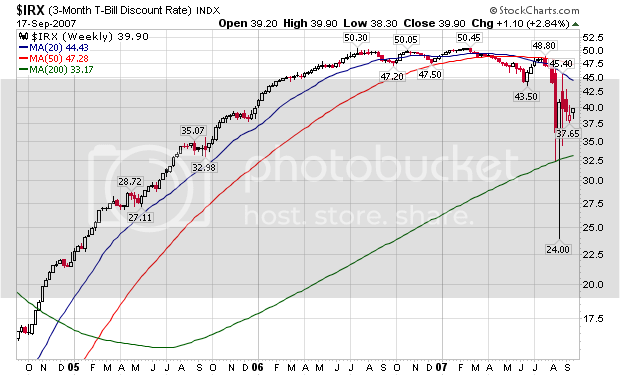 The price trend for 2007 isn't along far enough to say prices will definitely be higher. But this week's move (or lack thereof) should put people on notice that this year might be different. 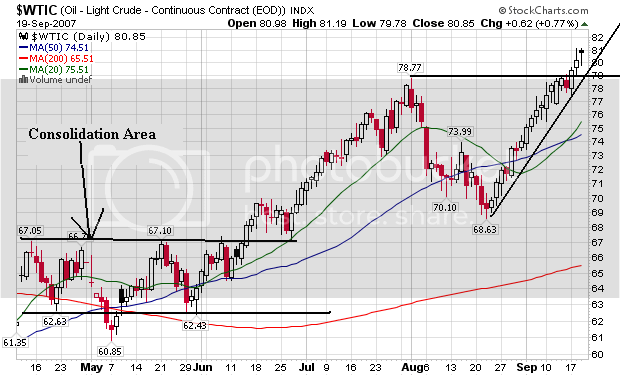 oil stocks are at the upper end of their range. Also note the demand has increased from last year. This is a situation we'll have to keep an eye on. Remember from the price chart that US consumers had very high gas prices in the spring before the beginning of the summer driving season. Above is a chart of inflation adjusted personal consumption expenditure, seasonally adjusted at an their respective annual rates. 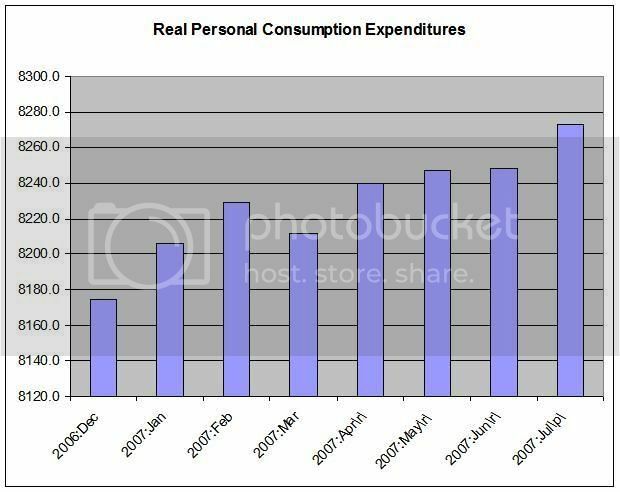 Notice this spring that the increase in these expenditures wasn't that impressive. I am guessing that gas prices had something to do with that. If we have a similar gas price problem going into the fall we could have some serious trouble. 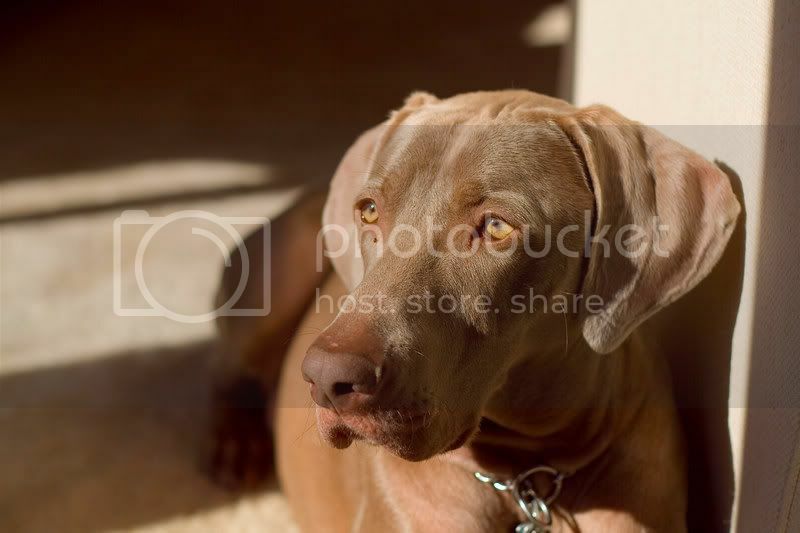 First, thank to the Big Picture for linking to the post below. Now -- let's see what the markets did yesterday. Can anyone identify when the Fed cut rates yesterday? Seriously -- the markets were extremely pleased with the Fed's actions yesterday as the huge spike in price and volume indicate. This chart is pretty straightforward. The 7-day chart shows the market's consolidation over the last few days provided a nice base to work off of for a further rally. Finally, we have the daily chart which shows the markets made a clean break from the trading channel of the last month and a half. The market made a big move higher on strong volume. These are strong technical movements. What the market needs now is follow-through. 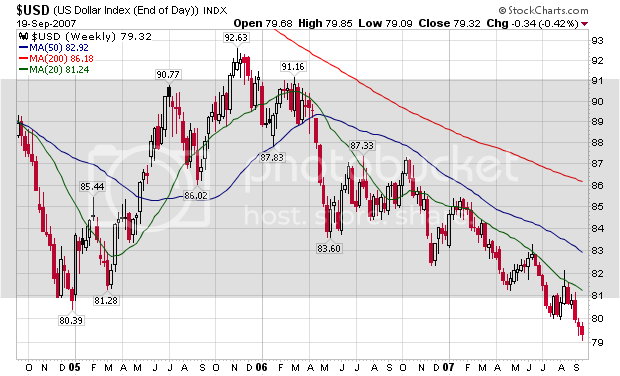 Finally, we have the US Dollar which is obviously not a beneficiary of the latest move by the Fed. Forex traders area obviously betting against the dollar now in bigger numbers. Don't expect this trend to diminish anytime soon. This is the soft under-belly of the Fed's move. The dollar is now more vulnerable to downside pressure. That could be a very bad development. The dollar sank against other major currencies in international trading Wednesday, as the Federal Reserve's sharp interest rate cut overnight eroded its yield advantage and fueled concern that the U.S. economy's outlook may be gloomier than expected. The dollar dropped to a record low versus the euro, rising as high as $1.3987 in morning European trading before settling back to $1.3981, above the $1.3971 it bought in late New York trading the night before. The U.S. currency fell below $1.0100 against the Canadian dollar for the first time in nearly 30 years. The British pound rose higher against the dollar, too, reaching $2.0157, slightly above the $2.0131 it fetched late Tuesday in New York. "Some players are wondering if the Fed's decision suggests that the U.S. economy will go from bad to worse in the near future," said Michiyoshi Kato, a senior trader at Mizuho Corporate Bank. "If that is the case, it's very difficult to buy the dollar now." 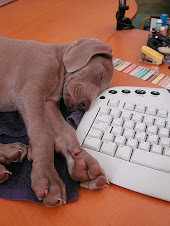 I'll do a market recap in the morning. Let's go back to the beginning of the year and look at every Fed policy statement. Readings on core inflation have improved modestly in recent months, and inflation pressures seem likely to moderate over time. However, the high level of resource utilization has the potential to sustain inflation pressures. The Committee judges that some inflation risks remain. The extent and timing of any additional firming that may be needed to address these risks will depend on the evolution of the outlook for both inflation and economic growth, as implied by incoming information. Economic growth was moderate during the first half of the year. Financial markets have been volatile in recent weeks, credit conditions have become tighter for some households and businesses, and the housing correction is ongoing. Nevertheless, the economy seems likely to continue to expand at a moderate pace over coming quarters, supported by solid growth in employment and incomes and a robust global economy. So even at that meeting, the Fed thought growth would be OK. That was a month and a half ago. In a month and a half the enough things have gone wrong to warrant a 50 BP cut. And even then, the Fed is still concerned about inflation. In other words, enough indicators have turned negative in the last month and a half to warrant exposing the economy to a higher-inflation monetary policy even at a time when the Fed is concerned about increasing inflation. WOW -- that is something I was not expecting in any way. Allow me to pay myself on the back. I was right in 2/3 of my predictions. Not bad. Just look at this chart. It's not a pretty picture. OK -- Here is what the Fed is going to say. 1.) There will be a 25 BP cut. 2.) Downside risks have increased. 3.) There will be some mention of inflation, but it will take a backseat to #2. Late summer brought no relief from soaring foreclosures. The number of homes in some stage of default jumped 36 percent month-over-month in August, according to a regular monthly survey. Delinquencies and defaults more than doubled year over year to 243,947, according to August figures released Tuesday by RealtyTrac, a marketer of foreclosed properties. RealtyTrac's forecast is for total foreclosure filings to exceed 2 million this year. "The jump in foreclosure filings this month might be the beginning of the next wave of increased foreclosure activity, as a large number of subprime adjustable rate loans are beginning to reset now," James Saccacio, chief executive of RealtyTrac, said in a statement. None of these numbers are good developments. And they simply continue to increase on a regular basis. Now we have an incredibly tight credit market and stricter lending standards. This is going to continue to be a downward trend for the foreseeable future. According to the report, energy prices dropped 6.6% and food prices dropped .2%. The change in finished goods increased (unadjusted) 2.2% from a year ago, which is the slowest increase since January of this year. I assume the Fed has advance information on the economy and economic statistics. I have no basis for this belief, other than they are the Governors of the Federal Reserve and they are therefore entitled to advanced information. That being said, I am assuming the Fed has this information awhile ago. This news gives them more wiggle room regarding interest rates. However, until their latest statement about the discount rate, they have continually stated in their policy statements that inflation is still a concern. So they'll have to either backtrack on that observation or continue to argue the threat to long-term growth is more important. The Federal Reserve will probably cut its benchmark interest rate today for the first time in four years, seeking insurance against a recession. The main question is how big a policy Chairman Ben S. Bernanke is ready to buy. While a quarter-point reduction in the federal funds rate may not be enough to bolster growth and investor confidence, a half-point cut might fan inflation and be perceived as giving in to pressure from Wall Street firms that made bad bets, especially in the market for securities backed by subprime mortgages. I'm expecting a 25 BP cut today. I have no idea where the 50 BP idea came from. From what we have seen from Bernanke, we know he's a gradualist. At minimum, he'll only lower 25 BP because that leaves him with more ammunition for possible further cuts. In addition, I wouldn't be surprised to see further action on the discount rate. While I at first was against this move because I thought Bernanke was paving the way for a Fed Funds cut, I now think cutting the discount rate was a good idea, largely because it is a rate specifically targeted at the financial community. That's where all of the problems are occurring right now. The short term credit markets are clearly not out of the woods, employment growth is weak and the housing market is in a mess that won't turn around for a long time. No matter what Bernanke does, he's between a rock and a hard place. I certainly don't envy his job in any way right now. Thanks to a bank run in Britain, the US market opened lower but recovered fairly well by the end of the day. All in all, this was a treading water day before the Fed's announcement. 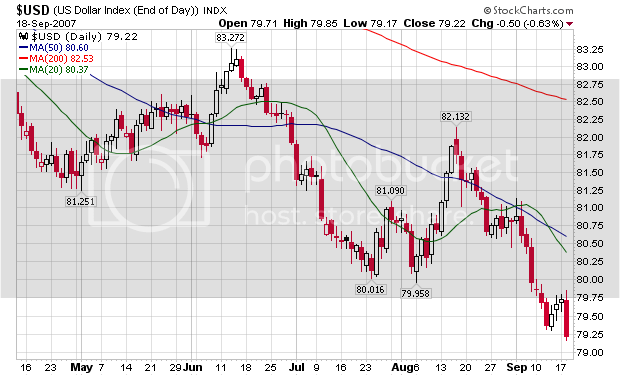 The 6-day chart shows the markets are still trading above the 38.2% Fibonacci retracement from a last weeks rally. There are two other charts that are interesting right now. This is a three-year chart of the gold ETF. This index consolidated for most of last year, but has since broken out of the trading range and is spiking higher. With a Fed rate cut expected, gold traders are concerned about inflation running hotter. Oil's been rallying lately as well. There are two separate reasons. The first is supply concerns in the US. 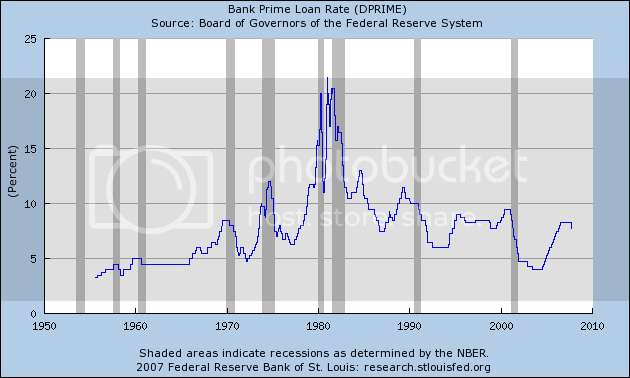 The second is a belief that a drop in interest rates will increase demand in the US. If this spike continues, the US consumer will be under more financial pressure from high gas prices which usually drop in the fall. The Empire State Manufacturing Survey indicates that conditions for New York manufacturers continued to improve in September, but at a slower pace than in the past few months. The general business conditions index fell to 14.7. The new orders index dropped, while the shipments index declined sharply. The prices paid index, although elevated, held steady, as the prices received index rose several points. The number of employees index inched upward. Future indexes conveyed continued optimism, with the future shipments index increasing notably. The capital expenditures index fell for a second consecutive month. Industrial production rose 0.2 percent in August after an increase of 0.5 percent in July. At 114.4 percent of its 2002 average, total industrial production in August was 1.7 percent above its year-earlier level. Manufacturing output fell 0.3 percent in August after five consecutive months of increases, mining output dropped 0.6 percent, but unusually hot weather contributed to an increase of 5.3 percent in the output of utilities. The production of consumer goods edged up 0.1 percent in August. The production of durable consumer goods decreased 1.0 percent; the drop was due mainly to a reduction of 2.1 percent in the output of automotive products. Elsewhere, the output of home electronics declined 0.2 percent; the output of appliances, furniture, and carpeting fell 0.6 percent; but the index for miscellaneous durable goods rose 0.2 percent. The production of nondurable non-energy consumer goods fell 0.3 percent; decreases in the production of foods and tobacco, of clothing, and of paper products more than offset an increase in the production of consumer chemical products. Boosted by residential sales of electricity, the index for consumer energy goods rose 3.5 percent. The index for business equipment fell 0.2 percent in August. The output of transit equipment declined 0.2 percent, as a reduction in motor vehicle assemblies more than offset an increase in the production of civilian aircraft. The index for industrial and other equipment decreased 0.6 percent; although farm machinery increased for the second month in a row, other machinery categories registered declines. The production of defense and space equipment fell 0.6 percent. The index for construction supplies stayed flat in August. The index for business supplies rose 1.0 percent as a result of an increase in the commercial sales of electricity; the output of non-energy business supplies was unchanged. The production of materials rose 0.2 percent in August. Within non-energy materials, the index for durable materials fell 0.2 percent, and the index for nondurable materials fell 0.1 percent. The decrease in durable materials reflected reduced output of motor vehicle parts as well as decreases in a variety of equipment parts. Among nondurable materials, declines in the output of textiles and of chemicals more than offset an increase in the production of paper. The output of energy materials climbed 1.5 percent. The key to these reports is from the Fed's Industrial Production report: Manufacturing output fell 0.3 percent in August after five consecutive months of increases. In addition, the Empire State Index is still at an expansionary level. My guess is we're simply seeing a natural drop after some increases. Remember that exports are doing very well. They increased smartly in the latest report and the dollar makes exports very competitive internationally. I wouldn't expect this number to radically drop in the near future so long as the international economic scenario remains fairly strong. I'm a big fan of Dow Theory. The basic idea is simple. If an economy is doing well it will have to move stuff from point A to point B. This is true in a manufacturing economy (where raw materials are transported to a factory and finished goods are transported to the market) and a consumer economy (where goods have to be shipped to the place consumers purchase goods). The following charts are from Prophet.net which is a great site for charts and graphs. The trucking sector is already in bad shape. The index clearly broke an upward trend line in mid-July. The index traded around the 200 day SMA for about a month and is now consolidating below the 200 day SMA. The 20 and 50 day SMAs are both moving lower, indicating a high possibility of future price depreciation. Railroads have been dropping slightly since mid-May. The drop has been gradual. My guess is we're seeing traders slowing peel off profits as they wait for further confirmation of movement in one direction or the other. The 20 and 50 day SMAs are both heading lower. 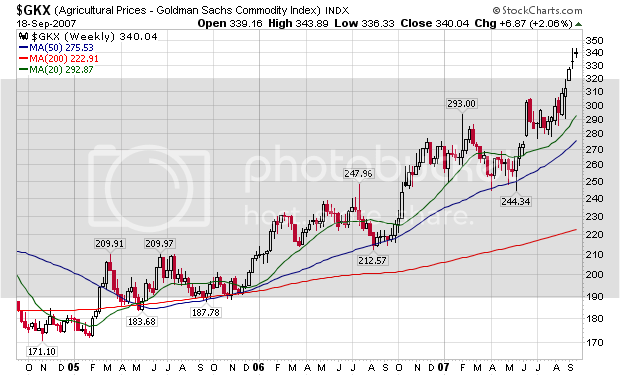 Finally, the index is heading for an important technical area where the uptrend and the 200 day SMA are converging. In short, both of these stock market areas are giving off sell signals to the broader market.